2. 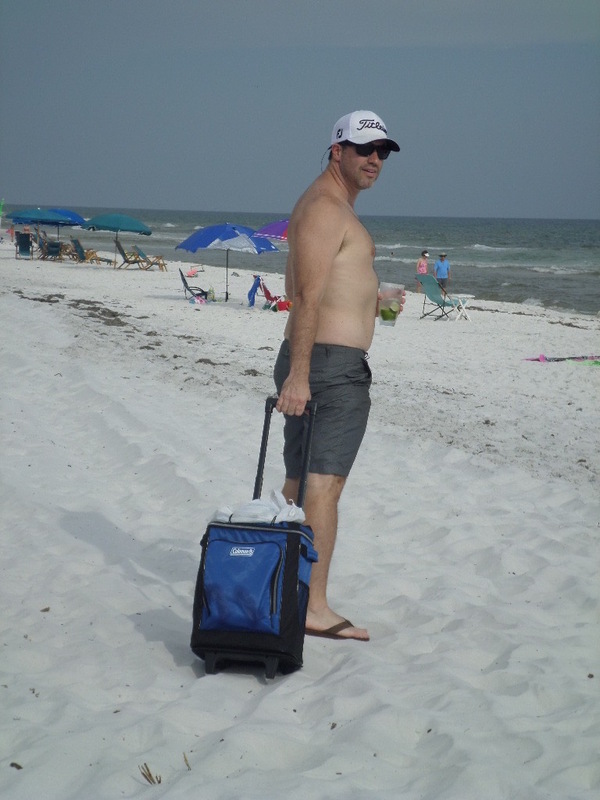 Get a cooler with wheels that works great in the parking lot or pavement and then drag it in the sand when you get to the beach. The large wheels make this cooler easy to take to beach and navigate through sand. 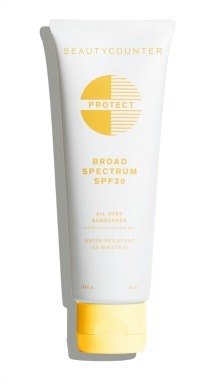 An insulated foil interior keeps things cold for an all day adventure at the beach. Their is a stabilizing bar that means when you are not rolling it - it will stand upright and not fall over into the sand. The handle has is adjustable to two heights. We like the two outside zipper pockets for paper goods or snacks that don't need to be kept cold. This one also has a removable inside liner which makes it easy to empty ice, melted water or to clean. 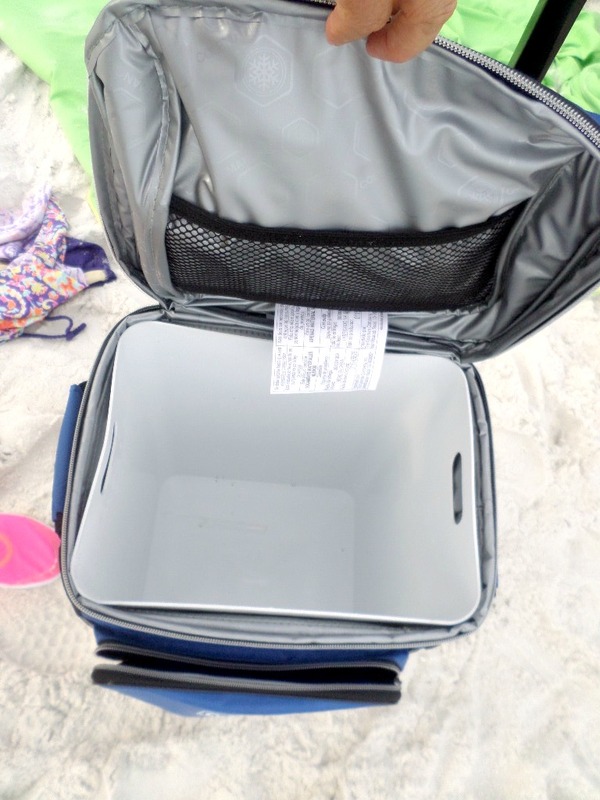 It holds lots of food and drinks - 25 quart.You will find this insulated cart to be and packs easily in checked luggage so you can take it when traveling by plane as well as by car. 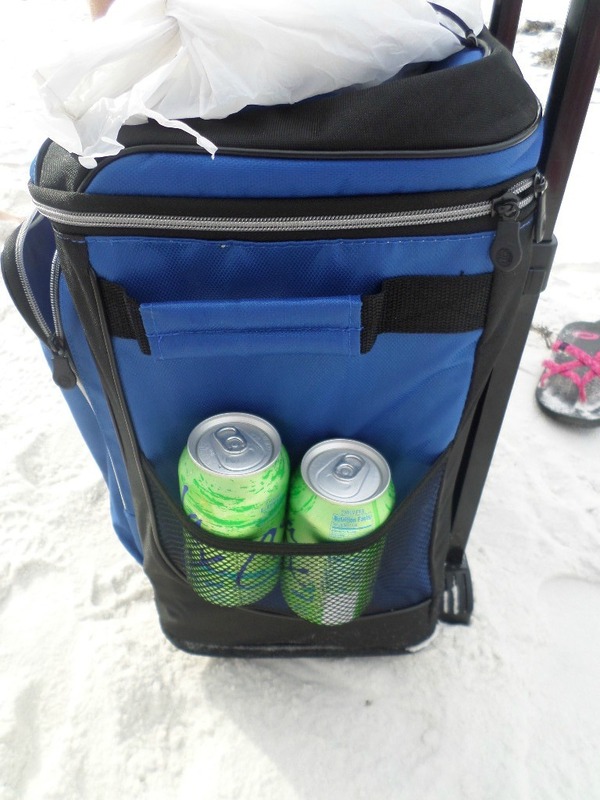 Soft sided coolers with wheels come with us on every beach vacation. It's the perfect size for keeping drinks and snacks cold for the day. We like how light weight a soft sided cooler is and that it's still easy enough to lift down the long flight of stairs to the beach. The cooler section is large enough for all the food and drinks you will need, and the easy glide wheels and telescopic handle makes it easy to take this cooler anywhere - on a hard surface. 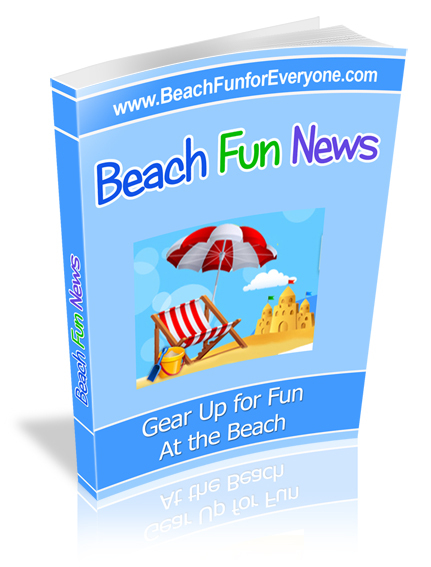 Once you get to the beach you can use the side handles to carry it or drag it in the sand. It's also easy to lift into the car with side handles and it doesn't take up too much room for those who drive to the beach. The sturdy pull handle has adjustable heights - so maybe you can get one of the kids to take on the cooler. 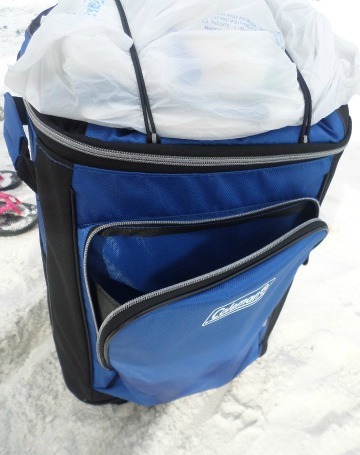 The outside mesh pockets provide places to store plates, silverware, books, cell phones or suntan lotion so they don't get wet from the ice. Two bungee type cords are on the top - we put all of our paper goods in a plastic bag and they kept snug under the cords. A front zippered pocket allows you to put magazines, paper goods or valuables so that they don't get wet. While this is a soft sided cooler there is a hard plastic insert that can be removed to clean or to drain any ice. The liner contains an antimicrobial protection that allows the liner to resist mold and odors. 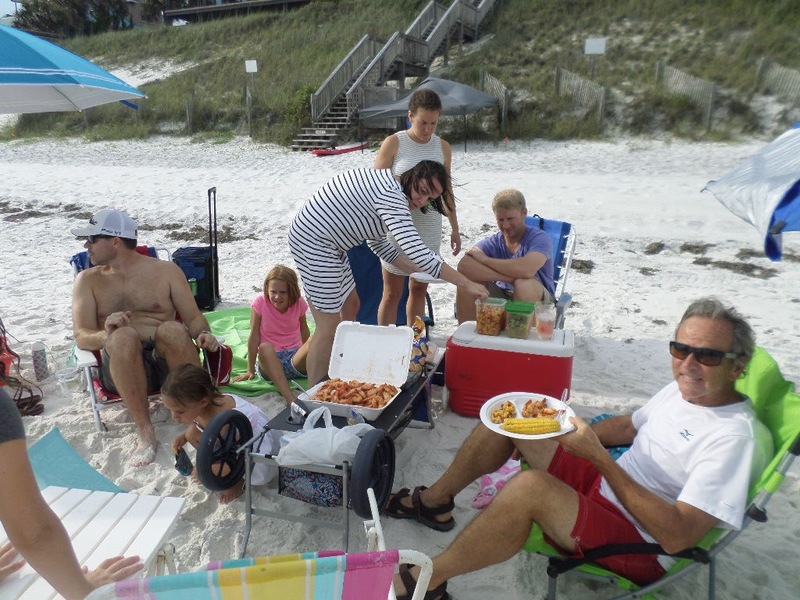 Ok for a group of 9, soon to be 10, we brought several coolers to the beach with us. This hard sided cooler with wheels served as a table for our food. 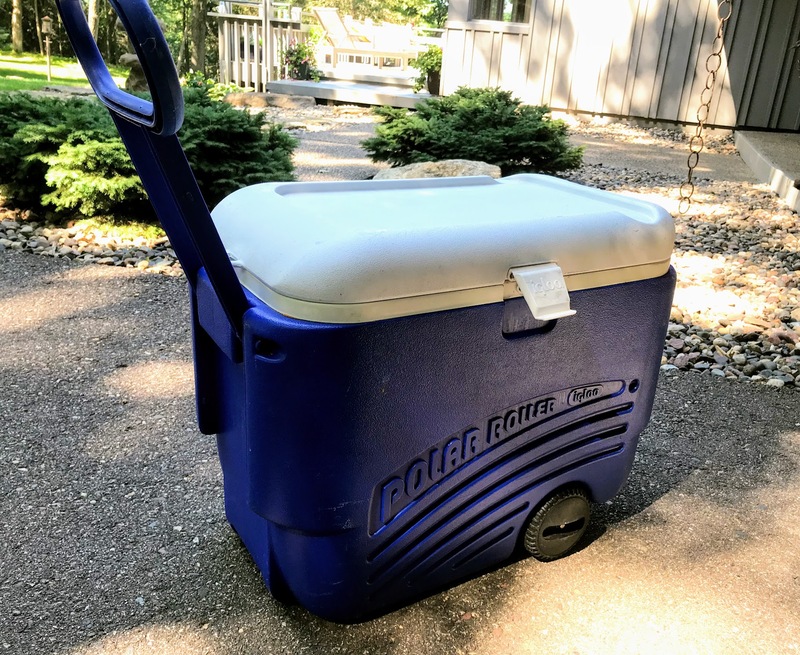 If you are looking for a large cooler that has enough space for a long day at the beach for the family or group of friends, this is the one. 1. The telescopic handle like on a suitcase - many of the other coolers have a short handle and makes it ergonomically hard to pull. 3. The oversized 6" wheels are helpful - but best on hard surfaces. 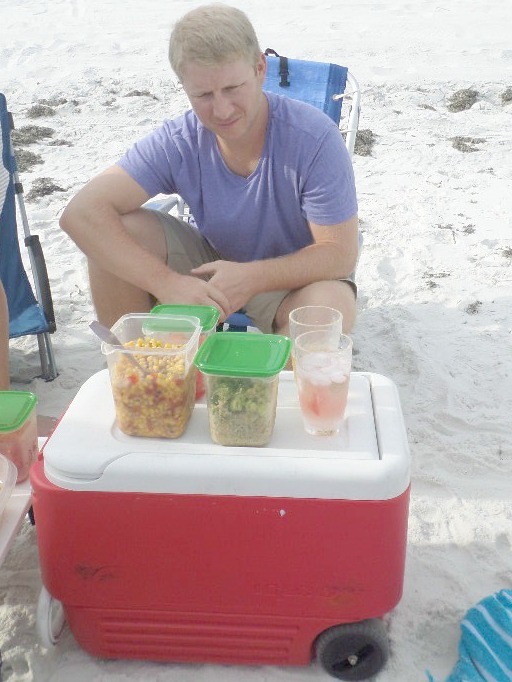 Igloo makes an easy to transport cooler with wheels and a handle. Big enough for drinks and food for several people and will keep your items cold for hours. If you don't like to mess with melted ice at the end of the day, use these reusable ice cooler packs. We like this set of four slim packs - about the size of a piece of bread - that can be easily distributed in the cooler to keep all of our food and drinks cold. Put them in the freezer overnight and they'll be ready the next morning. When the liquid inside them becomes solid, they are ready to be used.